Cheryl: thanks, lots to absorb. Quilt systems instead of sleeping bags.... hmmm. Actually it sounds like you use a combination of both systems when it's really cold. i see there are a bunch of Youtube videos created by people discussing the pros and cons. That will give me lots to digest. Mike: You don't have to be newly weds to want to curl up together. I just depends on your state of mind. Yes, when I'm congested and snore I try to get as far away from my wife as possible, as she does from me. If she's in one of those phases where she is getting hot flashes and the covers are on and off and on and off then yes we want to be apart. But after a long day of paddling and portaging it is sometimes easier to fall asleep and stay asleep and there is some, yes, after all the years, peace of being in the simple contact... that doesn't happen when we're in our separate mummy bags even if they are touching..... and as kinguq says there is definitely a warmth benefit to be had if you do it right. Ameany: I be curious what specifically about the double bag system didn't work for you. I find the devil is in the details. We didn't have a system so much as we bought a double bag and thought it would work for us to share one bag (we are both small - my wife is barely 100lbs) but we found that it was too constrictive and not enough room to move around in. 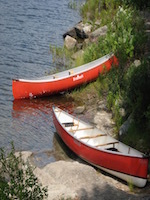 Doubles are a great idea if you want to increase the number of new canoeists!! I own a double bag and have used it maybe 1/2 dozen times. It works fine. I do find them to be heavier, but I suppose it is all based on what you want to spend. Lately on cold trips my wife will bring her 0 degree down bag and I will bring my bottom quilt and top quilt from my hammock set up, if my wife is chilly, I lay out the bottom quilt under both of us and throw the top quilt on top, I am a hot sleeper and she is a cold, no wait, freezing sleeper (she will want to bring a -10 bag in Aug when it is 30) Myself, unless it is winter, I usually never even zip my bag and my feet are always in the fresh air. The double set up works great, it just depends on the preferences of the sleepers that are using it. Thanks everyone. Definitely some useful input and a lot common stories about the difference in heat output of men & women while sleeping. The quilt and insulated sleeping pad combination really seems to be an expanding segment in the camping equipment market. On Youtube I watch a number of videos talking about the pros and cons of Quilts systems in comparison to sleeping bags. I definitely think that the quilt configuration or double sleeping bags that allows me to sleep on my side with my arms around my head but covered will be a bonus for how I personally sleep. Better than my current mummy bag. Alas, just another way for me to spend my money in my never ending pursuit to improve how I travel through the back country... and a good nights rest is definitely high on the list of improvements.